Across the world, many academics and other professionals now live in rural areas and make important contributions to their micro-local communities. Michael de Percy draws some lessons from his own experience in rural Australia where “tree-change” movements of an eclectic mix of people from big cities to rural communities have created something of a lifeline for otherwise endangered communities. Micro-impact projects can be defined as small-scale experiments and innovations in providing small-scale services to the community. Drawing on anecdotal evidence from my own experience of living in Gunning in New South Wales, I suggest that supporting micro-impact projects can help to keep rural communities vital, particularly in small villages. My previous research into telecommunications policy in Canada indicated the importance of small-scale community initiatives. In 2007 I was interested to see how micro-impact projects assisted in the provision of broadband and municipal wi-fi services to communities. This was noticeably a “bottom-up” process. One Canadian had already created a smartphone app for the Ottawa bus timetable (far ahead of other cities). Further north, First Nations communities had developed their own high-speed broadband networks and the anecdotal evidence suggested that service improvements were encouraging people to remain in their communities, rather than drifting to the major centres. In Australia, the culture tends to be different from Canada. As recently as 2009, students who developed an iPhone train timetable app received a cease and desist order and were threatened with legal action for breaches of copyright. Innovating inside major centres often presents just such obstacles. But rural villages are fertile spaces for micro-impact projects, arguably because market failure means that competing interests are absent, and the small scale means less hangs on “owning” data. A role for “tree-change” academics? Gunning is a rural village of about 500 people an hour’s drive north of Canberra, Australia’s capital. In addition to the families who have lived in Gunning for generations, the community is an eclectic mix of graziers, truck drivers, shearers, artists, actors, lawyers, academics, public servants, and various commuters and business people. The village is located on the Southern Tablelands of New South Wales, halfway between the larger regional towns of Goulburn and Yass. Council amalgamations years earlier resulted in Crookwell, a town 40 minutes to the north, being the centre of local government services. I made the “tree-change” to Gunning from Canberra about two years ago and shifted the focus of my community engagement activities to the local community. Thinkers including Epictetus, Voltaire, and Stephen Covey have recommended focusing one’s efforts on the things immediately at hand, and I was keen to do something useful in my new home town. Necessity is the parent of innovation, and rural people are well-known for their ability to adapt. My experience in Gunning suggests that micro-impacts can emerge as unintended consequences. For example, using the knowledge I gained from blogging about my teaching and research led to the development of a blog to showcase the village’s fascinating history. The blog for the local historical society now has several regular contributors, attracting ongoing interest from family historians and the media in Canberra and surrounds. The blog’s articles regularly attract around 1,000 readers (twice the population of the village). Leslie Bush, of the local tourism committee, said: “This undertaking has created more interest on a wider scale, has led to an influx of visitors to the district, and created more opportunities for new creative ventures in this field. As a result, tourism has grown exponentially”. In experimenting with new ideas for teaching, conducting pilots of computer-based workshops and seminars at the local library led to media interest and improvements in access to local facilities. The willingness of the community to participate was remarkable. For example, 15 people (that’s 3% of the population) attended a seminar on Practising Stoic Philosophy, a pilot for part of a leadership subject. Other seminars on researching the history of one’s house, military service records, family history, and so on have encouraged greater online use of the major cultural institutions, such as the National Library of Australia’s Trove database. As demand for the library increased, its opening hours were extended to weekends, providing access services for many locals who would otherwise have to go elsewhere to access books and computers. Weather reports in the large distances of rural Australia are another interesting issue. Reports of storms at Goulburn or snow at Crookwell often differ from the conditions present on the ground at Gunning. While on sabbatical in Jordan in 2009, I was involved with setting up a blog for a professor who was teaching electrical engineering students there to conduct experiments with remote cooling fans being triggered by rises in temperature. They were recording weather data as part of their research. 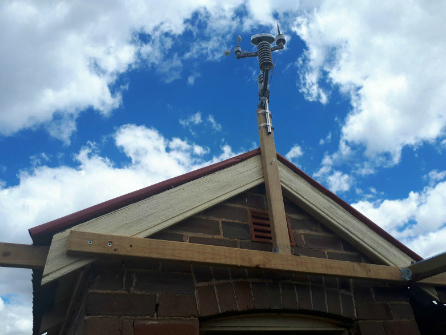 I became interested in setting up my own weather station, but at the time the cost of the equipment was prohibitive. Today, it is possible to purchase and set up an inexpensive weather station and share the information using social media platforms such as Weather Underground. Annoyed by the poor weather reporting in Gunning, I recently set up an amateur weather station at my house. I was surprised by the community’s positive reaction to the weather information. Internationally renowned Australian artist and Gunning resident, Margarita Georgiadis responded: “That’s brilliant! I’m going to check your weather station now, instead of guesstimating somewhere between Canberra and Yass”. An acceptance of innovating through trial and error is key. Rural people are used to working this way. Academics and other “tree-change” professionals can assist local communities by using their IT and other skills to help solve local issues. Local authorities often run tight budgets with little room for error. Recognition and measurement of the benefits of micro-impacts is an appropriate starting point. But these will often fall outside of the usual information channels monitored by local authorities. A micro-impact strategy should aim to be small-scale, wide-spread, and sustainable. Major community-led initiatives can often result in costly infrastructure that local councils are forced to take over and maintain. Small-scale experiments in service delivery pose less risk to council budgets while obtaining considerable improvements in local services. Featured image credit: Map by bluebudgie, via Pixabay (licensed under a CC0 1.0 license). Hi, Prof. Michael, your story on Gunning touched a nerve. I moved to Binalong , in October 2016. And naturally found some things lacking in an otherwise slice of Paradise. Possibly 500 residents. Yes, a decent weather report would be marvelous. No doctor, no chemist, a post office, small shop and lately a cafe, no library, the pub is closed on Sundays. An agreement so the struggling golf club can survive with weekend opening. My reason for the move here , from Warren, near Dubbo, was prompted by my owning half a house in Sydney. Like many others i am on a pension and the growth in value was killing it. The social; upheaval must be enormous from this factor alone. I had separated from my wife in Sydney and left her in our home, not wanting to oust her into the cold. Finally the loss of pension as the asset value crept towards $1000000. I was able to convince my son of the wisdom of buying my half. He was back living there anyway and it is a good mix with super I think.